Tony Downes is an Administrative Officer in Census Publicity with the Central Statistics Office. Census day is on 24 April, the exact centenary of the 1916 Rising. If you didn't receive a census form yet, you should call 1850 2016 04 to get one. Information about problems in the US census is here. 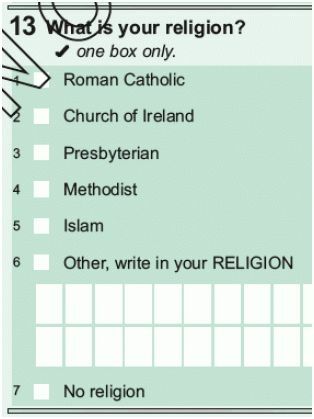 Note that the initial question on religion in our census assumes that the respondent has a religion, and that religions are presented in declining order of popularity in the previous census, but No Religion, the second most popular response by a wide margin, is listed in seventh place, separate from the rest of the list. 10 per cent don’t believe in god. Which makes you wonder exactly what exactly the five per cent of Irish people who identify as Catholics, do not believe in life after death but do believe in heaven are thinking.